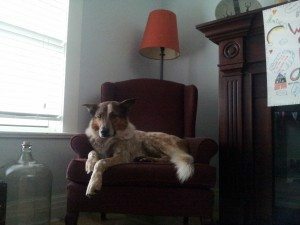 In March of 2014, our four-year-old dog, Séamus, began to hobble with pain after our morning walks, limping so severely he would spend the rest of the day quite motionless. We shortened his walks and kept him on-leash so as to manage both the speed and length of his mobility, to little avail. After performing X-rays, our vet determined that there was some inflammation in his carpal region. An eight-week regimen of laser treatment was suggested to us, and after weighing the pros and cons, we deci ded to try it out. Under this approach to his injury, Séamus did exhibit some slight improvements—the limping would subside for a time, and then it would return—we made do with the ebb-and-flow character of his injury. Essentially, the vets were perplexed as to how to foster a more successful recovery. They put forth the idea of visiting an orthopedic specialist—we were uncomfortable with this avenue because he was too young, and the idea of surgery seemed too physically intrusive. We resolved to pursue other options. A personal chiropractor put us in touch with Dr. Mishka, and after our first appointment, in June of 2014, Séamus slept for nearly two days, and exhibited an improved mobility—more so than anything he had demonstrated in the preceding three months. We were overwhelmingly impressed with the results, and after a difficult and anxious few months, we finally had great hope for Séamus’ future. We saw Dr. Mishka every week for approximately six weeks, and he displayed incremental improvements with each visit. We are immensely happy to report that with only the occasional visit, Séamus is not only injury-free, but a huge fan of both his chiropractic adjustments and his new friend, Dr. Mishka.